I love spring - who doesn't? It is a great excuse to get out of the house, spend time with friends and enjoy some luscious florals! What happens at a Bridal Suite Tea Party? Imagine the morning of your wedding. Everything is planned, getting set and you're getting ready to go. Then it hits you: You're hungry. I know that someone "always thinks of something" but do they? How much thought have they put into it? My intention with this service is to make a bride's most special day in her life, unforgettable. I know that sounds lofty, but think about it: The rest of the day becomes a blur. There is hardly enough "alone time" during the rest of the day to be fully present; to remember the actual details of the moments... And I truly hope that your wedding truly is unforgettable and remains fresh in your mind, always. The last moments of your single life are spent getting ready in the Bridal Suite. Literally. There are nerves, excitement, tears, thoughts, to-do lists, do's dont's. Your girls are there. Mom. The photographer... But most importantly, you are ever present in this moment, getting ready for the rest of your life. People who love tea always say how meditative it is, how conducive to bring you to the moment, how it brings you closer to those around you who are sharing that moment with you. The moments before your wedding are equally as important as the actual wedding. They shouldn't be an afterthought. You shouldn't be in a hurry, eating a deli spread from the grocery store. It is important to be intentional and mindful of that moment. One of the other things that I know is that all of my wedding photographer friends always rejoice or struggle with the little details at a Bridal Suite. There are the shoes, the Something Blue, The Something Borrowed, the silk ribbon... there are also the leftover brown paper napkins, the plastic bags and leftover foods invading every surface in the area. I don't know about you, but I have always been drawn to the suite shots. They always seem some of the most special ones. This is why I love the Bridal Suite Tea Package. It is a lovely way to have a sweet and bonding moment with your lady friends, moms and whoever else is in the suite with you. A feminine moment, light food, tea (it's good for you! ), beautiful china, pretty pastries... And the pictures are amazing! What happens at a Bridal Suite Tea? The process starts by having a short (or long, if you want to chat) chat over the phone about what you are looking for, the size of the package you'd like and my recommendations for what we can do. 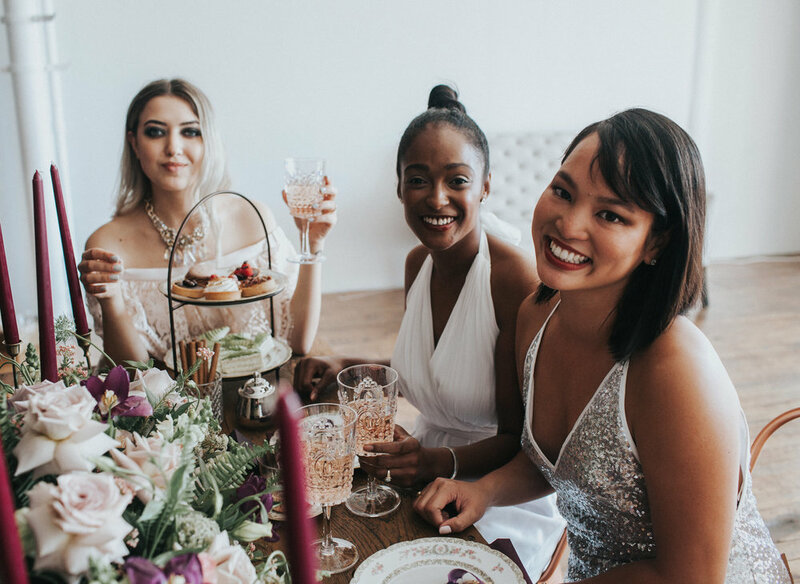 The day of, we arrive at the location where you are getting ready and set up the tea, drop it off and pick it back up after your bridal party has left for the wedding. No stress. You all can eat together, or one by one, as everyone gets ready, however you'd like. A menu of four or six (or more for custom menu) petit-fours and savory pastries. One (or more for custom menu) types of tea. A floral arrangement (if you'd like your florist to provide these, I can coordinate with them). All china and tableware needed, from tea cups and saucers to cake stands and platters. Accoutrements for tea and pastries: sugar cubes, jams, clotted cream. Yes! We love planning bespoke events and want to make your event as special as possible. Are you on a health kick and don't want sugar? We can have an all savory menu and fresh fruit. All customizations fall outside of the flat-fee format. id like to know more about this package!